Feeling uninspired when it comes to incorporating greens into your diet? Not to worry! Here are 17 fun and easy ways to get those greens into your daily routine! Smoothies: From smoothies to smoothie bowls, incorporating leafy greens or our Green Superfood powders is as easy as it gets! Oatmeal: Whether you blend some of our Green Superfood into a bowl of oatmeal or get fancy with a bowl of zoats, this is a quick and easy way to incorporate greens first thing in the morning! Almond Milk: Step up your almond milk game by adding a scoop of leafy green superfoods! Kefir or Yogurt: Yogurt and Kefir are way more fun when they’re green, right? Add some nutrients to those probiotics for a gut-healthy snack! Water: Looking for simplicity? 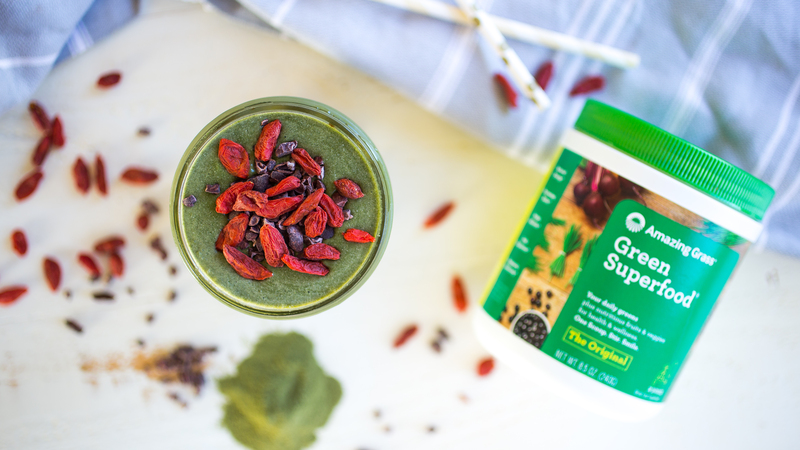 Nothing says simple like scooping some of our Green Superfood into a glass of water! Soups: Not only can you add fresh leafy greens to soups and stews, but our Green Superfood can make an easy edition to any comforting soup. Energy Bites: Try these No-Bake Superfood Pumpkin Bites for a delicious and nutritious pick me up! Popsicles: The options for adding greens to popsicles are endless… these Dreamy Creamy Orange Greensicles or Green Smoothie Detox Pops are enough to get your started! Muffins: These Leprachaun Zucchini Muffins are great for St. Patty’s Day or anytime you want an extra helping of greens in your morning routine! Juice: Whether you’re blending fresh leafy greens into a homemade juice or using some of our Green Superfood, juice is a delicious and easy way to incorporate greens. Pancakes: These Gluten Free Green Pancakes are so delicious that if it weren’t for their color, you would never know they contain nutrient-dense greens! Cupcakes: Cupcakes and greens, because life is all about balance, right? Check out our recipe for these Superfood Vanilla Protein Cupcakes. Hot Chocolate: Cozy up on the couch with this Superfood Hot Cocoa. Veggie Burgers: Add some nutrients to your main course with this green superfood Black Bean Burger! Sauces: From Creamy Avocado Dip to Pesto, Adding our Green Superfood to your favorite sauce is as easy as scooping and stirring! Salad: Whether it’s fresh leafy greens or adding our Green Superfood to your favorite salad dressing, salads are a no-brainer solution for incorporating greens. Mocktails: Take a sip of this Pineapple Jalepeno-Infused Mocktail for a spicy and nutrient dense pick me up!